This game is just so wonderful and perfect in every way and so in this review I’ll try and explain all of its virtues to the best of my ability. First, before I even start to talk about the game itself, look at the title: what a funny pun it is! 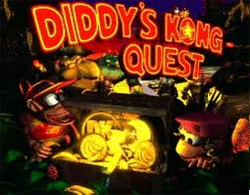 Anyway, in this game Donkey Kong has been kidnapped by King K. Rool (another pun! Get it?) who has recently become a pirate and renamed himself Kaptain K. Rool. As such, Diddy sets out with his girlfriend Dixie in order to rescue him. A nice basic story which anybody can enjoy, but not one which is so basic that you don’t care for it. Plus, the pirate theme is used perfectly, you can swim through the ruins of a sunken ship, look out onto the horizon and watch the sun setting behind the sea and search every single level for very well hidden golden coins (which have a very important use! But I won’t spoil anything). Piratism isn’t the only theme either: when you reach Crocodile Isle is seems to be a really rather diverse place: you explore creepy old castles, haunted woods, super fun funfairs, dark volcanoes contrasted with the bright oranges of lava and many more. The gameplay as well is very good. While it may just be a simple side-scrolling “finish this level and go to the next!” affair, every level is still very big and full of secrets so it still feels like your exploring a large open world. Plus, you’re given a handy world map which allows you to return to past levels at any time (and to do everything, you will need to!). I could talk about the good features of this game for a long time, but it might end up as the longest entry on here! Another important point I’ll just quickly mention is how beautiful and atmospheric the game’s soundtrack is. Perhaps this is all just nostalgia talking, but I love this game just as much every time I play. I think this is the only game I can give a perfect score of 10/10 to… So far anyway.